Webster County Community Hospital - Old: Radiology. The Radiology Department at Webster County Community Hospital provides eight modalities, encompassing a full line of services for inpatient, outpatient, and emergencies. Routine procedures can be scheduled on weekdays, and technologists are available to perform exams 24 hours a day, 365 days a year, with a board certified Radiologist on call for readings 24 hours a day. Our department is compiled of dedicated and caring staff members with over 40 years of professional service and imaging experience. All staff members are nationally registered with the ARRT and hold Nebraska licenses. Below is a brief overview of the services available and when they are performed. Mammography is a safe, low dose x-ray exam that produces an image of the inner breast tissue. This x-ray is used to visualize normal and abnormal tissue within the breast. 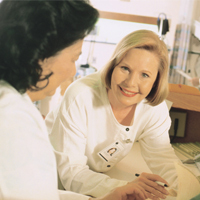 All mammograms are interpreted by a board certified Radiologist. Monday thru Friday 8am thru 4pm by appointment and walk-ins welcome with Doctor's order. Magnetic Resonance Imaging, or MRI, is a diagnostic testing procedure that uses magnetic fields to create pictures of your body in all three directions: sagital, coronal, and axial. It is a painless, non-invasive way to obtain detailed information to help your Doctor fully evaluate your health. MRI does not use any radiation to create images. We are unable to scan patients who have an implanted pacemaker with the MRI scanner, due to possible risks of complications. Service is provided by Shared Medical Services each Saturday by appointment. Ultrasound is a diagnostic medical method of imaging disease using high frequency sound waves. Sound waves are directed into the body from a transducer. The sound waves make contact with internal body soft tissue structures and are reflected back through the transducer to the Ultrasound machine. From there, they are electronically converted into a picture/image. The final images are evaluated by a board certified Radiologist who evaluates the images and dictates a final report. X-Ray/Radiology is a diagnostic testing procedure that gathers information about the inside of your body by using ionizing radiation to create an image. It is a painless way to obtain detailed information that can help your doctor assess your medical condition. General x-rays are available form 8am till 5pm, and emergent studies are available by Doctors requests after hours. CT is a diagnostic testing procedure which combines x-ray images with the use of a computer to generate cross-sectional images and, if needed, three-dimensional images of the internal organs and structures of the body. We have a 16- slice machine which allows the technologists to perform even the most advanced CT examinations.